Aside from creating illustrations, I enjoy photography. With the ease of digital photography it is easy to amass a huge number of shots during a vacation or outing. Let’s say that you have a folder of vacation photos that you’d like to send as an email attachment or that you’d like to share with others. Using a modern digital camera, those photos will probably far too large to send as an attachment. 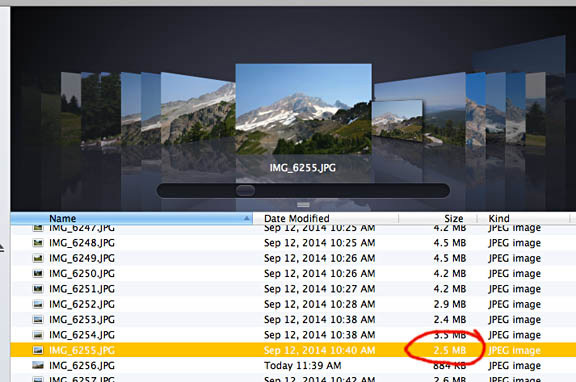 My eight-year-old old 8 megapixel Canon Digital Rebel produces images that are 48″ x 32″ and roughly 2-4.5 MB in size. 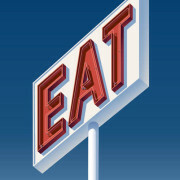 This size is fine for photo editing, but far larger than necessary if sending as email attachments, especially if you have several images to send. You could go through each individual file and reduce the size down to, say, 12″ x 8″. That would work fine, although it’s tedious and time consuming. 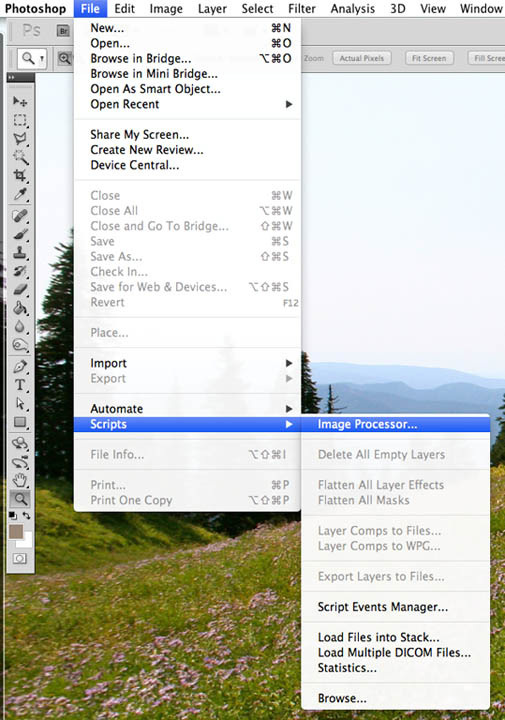 There’s a much faster way and that is by using batch resizing in Photoshop. Inside the folder Mt. Hood Photos there are 53 jpegs at 4*’ x 32″ at 72 dpi. 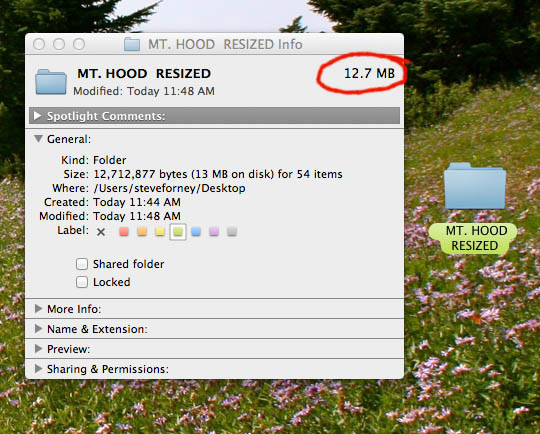 Pressing Command-I on the Mac, a window pops up to indicate a total file size of 197 MB. Thus is way too large for our purposes. 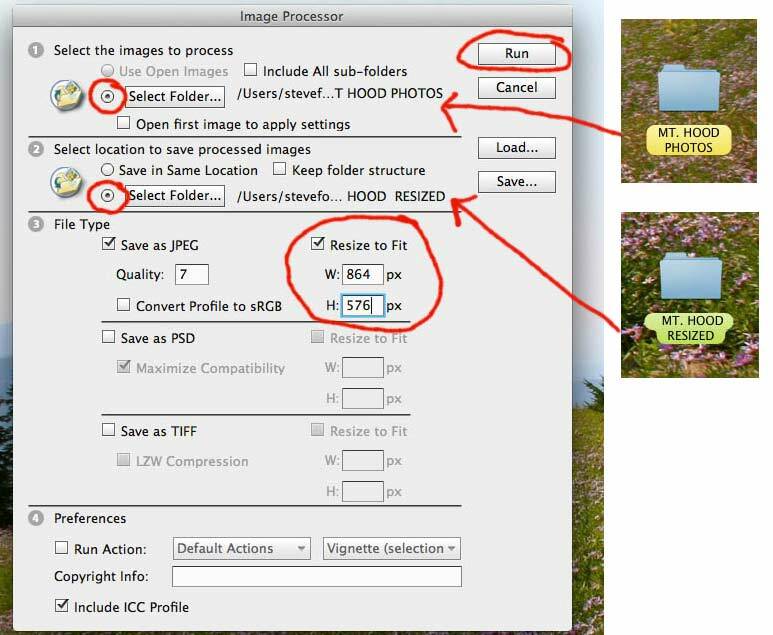 Go to File>Scripts>Image Processor and select the Image Processor box. The above dialog box will appear. Select the folder which contains the photos to be processed. 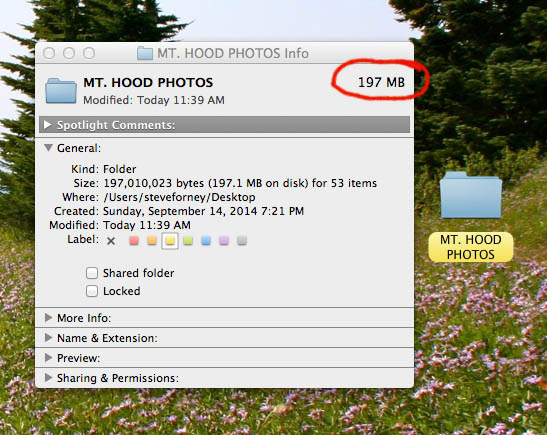 I selected the MT HOOD PHOTO folder. If you prefer, you can save them to the same folder. 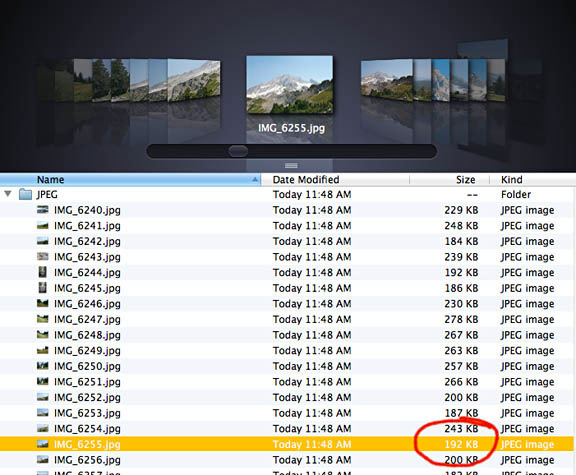 The adjusted images will later appear in a separate folder within the folder that is selected. Instead I prefer to have them end up in a separate folder that was created prior to the exercise. Under file type, select measurements to resize. I entered 864 x 576 pixels, which is 12″ x 8″ at 72 dpi. After that, click “Run” and the process begins. You’ll see the images temporarily flash on your screen as they are processed. Here is a screenshot of the images prior to resizing. Note the large MB size of each image. Here they are after processing. The images range from 184 to 250KB each. Press Command-I on the destination file and you’ll see the reduced file size. From 197 to 12.7 MB in a matter of seconds. Now your file is much smaller and easier to share. Give this exercise a try whenever you have a large batch of photos to reduce. It’s a huge time saver.